Come sail the DINO-PIRATE seas on a demon-haunted ship! I am embarking on a new sort of venture: a serialized story. 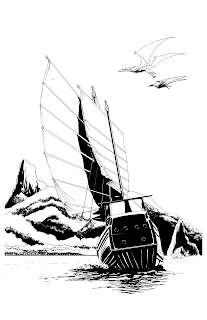 Each month, I’ll be publishing a new episode of THE 17 EYES OF JUSTICE, a pulp adventure tale about a desperate captain and her haunted ship. Each episode is meant to be a more-or-less standalone story, another thrilling adventure featuring Captain Li and her intrepid crew. They battle sorcerers, gangsters and ninjas, all the while searching for a way to free themselves of the soul-eating demons that possess their ship. But if you read them in order, you’ll find an epic tale of a woman’s search for her father, and answers to the mysteries of her past. 17 EYES isn’t exactly a novel, and it isn’t just a collection of short stories. It’s more like a season of a TV show, like Spartacus or Deadwood, where each time you tune in you’ll get a satisfying, complete tale that nevertheless fits into a larger narrative. You’ll be able to read an episode in an hour or so, and I think you’ll find it fun to go back some times and look for clues and hints that were planted earlier. I hope you tune in, and that the story keeps you engrossed — but not too frustrated. I’ve always loved this kind of story-telling, and it’s really how my brain normally conceives of tales. As a DM, I think of an “episode” like a particular adventure that goes into making up a campaign. There are connections from one adventure to the next, and mysteries revealed in one adventure may not get solved for some time afterwards, but each adventure is a complete quest in its own right. There are a dozen episodes planned, and the first three are already written and available for you to read today right here on the DINO-PIRATES OF NINJA ISLAND website. Or you can buy them on Amazon for your Kindle. I’m very excited about this project, and I hope you’ll join me in this experiment. Remember that if you sign up for my email “story-letter” not only will you get free stories every week, set in the same world as 17 EYES, you’ll also be able to download the first episode of THE 17 EYES OF JUSTICE completely free. Being a GM isn’t EXACTLY like being a writer, but I keep finding lessons from the one that help me with the other. I wrote a piece previously about how a solid GMing practice led me astray in my writing, but this time I want to share with you how a GMing problem revealed a useful tool I’ve used to blow through some kinds of writer’s block. I ran a game where part of the plot turned on having the heroes win over the old sushi chef so that he would lend his super ninja powers to their cause. Things ground to a halt when the player trying to accomplish this gave up when their first effort didn’t seem to succeed. Player and GM locked horns and the story started to flail. Of course, both the player and I wanted the same thing: for the sushi chef to join up. Where we differed was in our understanding of the scope of that story beat. In the player’s head, this was just one scene, one objective among many in the course of the story. In my head it was a big shift in the nature of the tale, a slow transition as the heroes rose to a new epic level. To them, the scope was small. To me, it was big. That disconnect in scope made for frustration. This happens in my writing, too. That heavy, dragging feeling as I push one word after another out onto the screen, typing with agonizing sludgeriness. I like the story. I think the scene should work. And yet, I find myself grinding, struggling to push through, losing faith and thrillsiness with every line. Sometimes I’m wrong and the scene is just no good and my story needs a major rethink. But often I find I’ve misunderstood the appropriate scope for the scene — and changing that can blow the scene right up. When I got into writing that sequence, I realized what you probably already noticed: that’s ONE scene. Writing ground to a halt as I struggled to keep the fight going without descending into pointless detail, just to pad it out to a length suitable for three scenes. But in terms of the story outside of the fight, only one thing happens: the hero causes the dudes to run away. Not enough scope for three scenes. At first I didn’t realize what had happened. All I knew was that I was struggling, that I wasn’t even ENJOYING the process (which is strange for me — normally I really enjoy the actual writing, when I can manage to make myself sit down and do it). I grumbled and groused and did everything except write. I told myself what a terrible, terrible writer I am and why do I even bother and nobody’s reading this anyways and hey here’s a glass of whiskey how did that happen. But I recalled the episode with the sushi chef, and took another look at my outline, and realised I didn’t have enough story here. Instead of finding a way to grind out more words and try to fit my pre-conceived word count expectations, I realized the thing to do was to adjust the SCOPE of the scenes. This fight was really one scene. Reducing its scope, while retaining the basic structure of the fight, worked great, and the resulting scene was once again fun to write. And the change in structure opened up another plot possibility, and I made up my word count with much better material. The new tale moves better, and has a more satisfying structure. My example of the sushi chef above was a case where I had put too much scope into the scene. I was imagining this chef becoming a major character, and the relationship he formed with the hero would become an ongoing thing. But honestly, the game at that point was about tracking down a gangster and stopping his plot, and adding all this stuff with the hard-to-impress sushi chef only bogged us down. Fortunately, sitting at a table makes for easy rejigging. We realised what had happened, agreed to move the scene along and reduced the scope. Play went on, and we had a memorable game session. Comparing writing with GMing has proven a fruitful way to get some perspective on issues in story-telling. If we hadn’t had that moment with the sushi chef, I might not have been able to solve the problem with the demon-punching. Thinking on these experiences lately, I realized how often I can find solutions to difficult story issues by stepping back and changing the scope of a moment. Even if it doesn’t lead directly to a solution, I find the exercise shows me where I’ve blinded myself in the story, and points to how I might get out of the grinding struggle. I’ve spent a lot of my life at the game table, running games. It’s good to know that experience can pay off as a writer, too. My writing has been a source of frustration for me, especially recently, and I’ve only just realised that the thing making it the most difficult for me is the very thing that has made another story-telling craft very successful for me: being a good GM. Okay, now it’s time for an example. Here’s how you put all the pieces from my “3-List” method together. FREE THE FLAME GOD is a free adventure for DINO-PIRATES OF NINJA ISLAND. It’s ready to run, and you’ll note it doesn’t require all that much reading. Let’s go through the document page by page and make sure we understand it. First up is the cover, which hopefully provides enough explanation that you can use the adventure (even without reading this blog post). Every DINO-PIRATES adventure will have this info. You don’t need to print this page. The second page is for the players. There’s a quick description of the Concept — the problem the heroes will have to solve, as well as a sketch map of the adventure locale. It’s not a very detailed map, and there aren’t any further detailed maps, since the whole idea in Old School Hack is that you draw the maps yourself at the table. This is just to give the players a bit of a mental model they can hang the encounters off. Then comes a page of tables: Adventuring Goals and Random Events. These are two of the lists that I use to create a DINO-PIRATES adventure. Print this page off and lay it out for the players to look at. If they want to choose an Adventuring Goal, that’s great, but it’s also okay if they don’t. You’ll use the Random Events table whenever you feel like shaking things up for the players. It’s a great way to pull in a player who’s been a little sidelined lately; just point at them and say, “Roll on ‘The God Awakes’!” Suddenly they’re at the center of attention. That’s it for player material. The rest of the document is for the GM. Next there’s a page that outlines the adventure — this is the list of Locations. It’s followed by three pages of Location Sheets detailing each one. Have the Location Sheets at the table and you can use them to keep track of the situation as the battle proceeds, and make sure you don’t forget any important clues or bits of knowledge you meant to give the heroes. Finally there’s a page of NPC sheets with more details on a couple of the key bad guys in this adventure. These characters might show up in more than one location, so you can have their details at hand without flipping through pages. And that’s it! Eight pages of thrilling adventure, totally free! I hope this enables hours of fun for you and your friends. Let me know how it works for you in the comments! Prepping for a DINO-PIRATES OF NINJA ISLAND game is actually really easy, but the key elements are not at all obvious. Here’s my system for ensuring game sessions full of crazy adventure. Having run probably more than a hundred of these sorts of sessions, I have a pretty tight system now for developing them. It really isn’t that much work, but it’s very different than the sort of prep work I do for other games. Instead of describing a location in detail, or setting up an elaborate plot, this system starts from a high-level idea — the Concept — that’s quite simple to come up with. Then I create three lists of loosely-related and not-very-detailed items, which work together at the table to produce a fun and satisfying adventure story. I always start with a Concept. It doesn’t have to be very fancy. Once I have that, I build three lists: one of Locations, one of Goals and one of Randomness. Those three lists will form the basis of the adventure. How they get combined is up to the players and myself as we play the game. Why do you THINK they call me “Heart-Eater”? I can come up with this sort of evil scheme just by playing around in the setting, and generating “what if” sorts of questions to myself. “What if an Imperial Sorcerer decided to go undercover and take over a ninja clan?” Even the simplest idea can work. Once I have the evil scheme in mind, I think about how the heroes would get involved to stop it. I don’t mean “They meet an old wizard in a tavern who tells them where to go”. That’s way too much detail, and who cares about all that crap? This is about choosing a VERB. Do they STOP the scheme, or DESTROY the hidden base, or RESCUE the prince? That’s it. One word does the job. So that’s my Concept — an evil scheme undone by a verb. Now I’ve got three lists to create. The order in which they get created isn’t important — actually I always build them in bits and pieces, letting ideas for one inspire entries in the other. It’s surprisingly powerful to supply a random factor that might interrupt heroes bent on saving the day. For the volcano god adventure, obviously I decided geologic activity would be the thing, so the random list includes lava, earthquakes and so on. For an adventure in which a bunch of heroes have to get a little baby to a distant fortress, the baby itself became the random trouble-making element. I make a little table for a d12. 1 – 6 is always “no result,” so that not every roll causes trouble, and then I come up with six other possible results for 7 – 12. 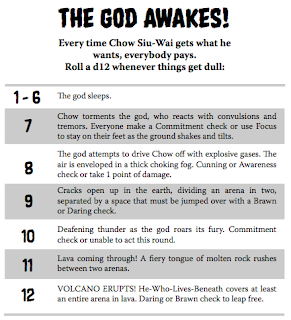 Here’s an example I used for the volcano god adventure. So there’s six possible results — each with a different in-game consequence. I always make 12 the biggest, craziest one, just because, well, it’s 12. The players have the table in front of them and every so often I’ll just say, “Okay, somebody roll on the volcano god table.” Then there’s a tense moment while they await the result, and then the game carries on. Who is Master Nobitsuna? Who are the Dragon’s Eye Clan? It doesn’t really matter at this stage. These details might inspire entries in one of the other lists, or they might not get referenced anywhere else. If a player picks this goal, we’ll figure out how it fits into the adventure together. It might seem like a strange thing to focus on, since in any given session, most of the supplied adventure goals won’t even be used. But I’ve always found it a great way to generate ideas that can feed into the story, even if nobody picks the goals. Thinking about the adventure from the point of view of the heroes, and why they might get involved, is a powerful way to sort of trick yourself into creating a really hero-centered adventure. For an adventure meant to last a few hours, I usually find four to six scenes is about right. What I normally do is come up with four “required” scenes and then a couple more “extras” — sidelines or flavorful moments that aren’t essential to getting the heroes to the big bad guy. I know my first scene is always going to be a fight — an immediate threat the players need to deal with in order to survive. But it must do two other things: it must lead the heroes into the adventure — there must be some clue or threat that draws or pushes them along. The first scene cannot be self-contained. It must present a mystery (“Why are these flying lava monsters attacking us?”) or force them into immediate action (“Well, the ship is sinking and there’s an island over there.”). Or both! And I know my final scene will be a big set-piece battle, preferably involving lava, dinosaurs and maybe some shotguns. My other two key scenes might be more sneaky-around scenes, or get-someone-to-tell-us-whats-going-on scenes, although often they’re just more fight scenes. I use the location sheets not only because they allow me to note down all the necessary details on a scene, but their small size prevents me from putting down too many details. This is a LIST of locations I’m creating, not a guide book. Locations, Goals and Random — three very different lists, each contributing something unique to the Concept upon which the story of the game will be built. Because they’re so different, when I get stuck on one I can easily jump to another, and usually my brain lights up again. And because they each need players to bring them to life, I know the game session is going to be spontaneous and creative for everyone. One of the real joys of running games, for me, is seeing a story emerge from something that wasn’t a story before. It’s really magical, especially when it happens from something like this — with just a basic concept and three lists of disconnected items. I have time and time again seen how a group’s imagination will take off and make a story happen right in front of us all. I’ll be publishing a sample adventure using just this format very soon — stay tuned! In the meantime, please share your adventure prep ideas in the comments! Here at Scratch Factory we’re big fans of making the DM’s job easier; that’s one of the key reasons we picked Old School Hack as the foundation for the new DINO-PIRATES OF NINJA ISLAND role-playing game. You really can’t beat Old School Hack for super-easy game mastering. But we also really kind of sneakily LOVE filling out forms. 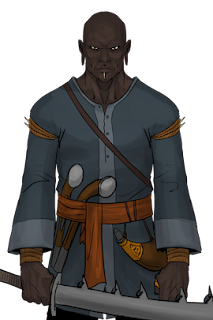 We’re addicted to character sheets, and have spent many long hours poring over how to fill out every field in our Campaign Planning Guide, and other such treasures. It’s one of the things we’ve always cherished about tabletop role-playing games, and we wanted to make sure that the new DINO-PIRATES OF NINJA ISLAND provided some of that love for the DM, not just the players. Easy-to-print, half-page forms that help you keep your notes organized, even if you’re making them up during play! Keep track of minions and bad guys, potential treasure or secrets to be discovered. Have your bad guys easily statted up before the big combat, or make them up on the fly and keep track so they’re consistent for next time. Anyway, you’ll have fun filling them in, and hopefully the process of doing so helps you think through your next encounter so you’re better-prepared than ever! In upcoming weeks we’ll show you some complete DINO-PIRATES adventures using these forms and a few other key ideas that make a DINO-PIRATES adventure special. Stay tuned! An all-NEW version of the DINO-PIRATES OF NINJA ISLAND roleplaying game! And it’s free! This game is based on (well, actually, just kind of copied almost wholesale from) the tremendous Old School Hack game by Kirin Robinson. It’s super-simple, and designed for running off the top of your head, with very little prep required. 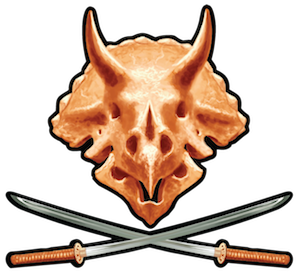 The full rules are posted on the DINO-PIRATES website, and are available for you to copy and reproduce any way you like, under a Creative Commons license. We’ve created a great downloadable PDF that turns into a bunch of handy-at-the-table miniature rulebooks, as well as the class and character sheets needed for Old School Hack. There’s nothing else you need, except a few friends and a lot of imagination! Well, and dice, and paper, and all that sort of stuff. In the days to come we’ll be posting more materials, tips for getting the most out of a DPoNI campaign, and other great stuff. The sharp-eyed among you will note that this is subtitled “Basic Game” — that’s not random. We are working on a more detailed sort of game, but it’s a ways out yet. In the meantime, enjoy the new Basic Game!